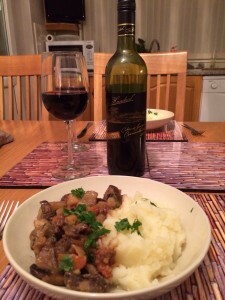 We revisited pot roast with garlic and wine from Supercook, a recipe that we had not cooked for a long time. Pancetta is fried off and discarded and the top rump of beef is then browned. Onions, garlic and carrots are then added and tomato purée, bouquet garni and red wine are poured over the beef. It is then casseroled in the oven. After cooking, the liquid is strained and the sauce is thickened with a beurre manié. Tomatoes are then stirred in. Finally the meat is sliced and green olives are scattered over. The sauce is served over and the remainder is put in a sauce boat to accompany. We served the meal with little roastie potatoes and garlic bread. We thought a Cabernet/Merlot blend would be a good pairing and opened a bottle of Pitchfork, Margaret River Cabernet Merlot 2012, a full-bodied Australian red from the Wine Society. We detected vanilla on the nose followed by creamy, smooth, chocolaty black fruits on the palate, with a slight spiciness. A good match with the beef. We saw an interesting recipe video on the Tasty Facebook page for a whole slow-cooked chicken. Salt, cayenne pepper, paprika, thyme, pepper and minced garlic are mixed together and rubbed into the chicken. Garlic cloves, lemon and onion are stuffed into the the cavity. Carrots, celery, onion and potato are added to the slow cooker, the chicken is placed on top and the meal is cooked on low for 8 hours. The chicken is then sliced and served with the vegetables. We had left out the potato and served instead with croquettes cooked separately. The chicken had interesting flavours reminiscent of Cajun cuisine. We were unsure what wine would go with the meal and had a little taste with a sip of South African Cabernet Sauvignon, but rejected this. Instead we opened a bottle of Burge Benchmark Shiraz 2014, a full-bodied Australian red from the Wine Society. We detected raspberries on the nose followed by smooth red fruits and a savoury, spicy finish. 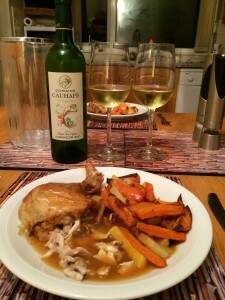 Whilst the wine was a good match with the chicken, it would be interesting to discover next time whether a white would be better. 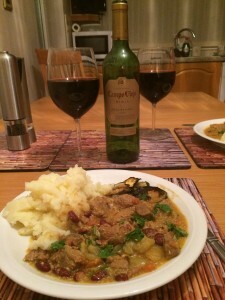 We fancied trying Autumn game casserole from the Slow Cook Book. Mixed game meat such as pheasant, venison and rabbit are slow cooked with onion, carrot, parsnip, fennel and mushrooms in cider and chicken stock. We garnished with chopped parsley and served with mashed potato. We weren’t sure what to expect and what would be a good wine pairing. Whilst there were pleasant savoury and sweet flavours in the casserole, our next using game will involve a red wine sauce. We sampled two reds with the dish. The first was The Hundred Cabernet Sauvignon Reserve 2011, a favourite of ours from the Sunday Times Wine Club. 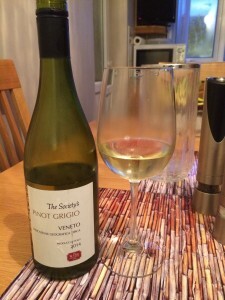 This full bodied Australian red delivered a slight sweetness, black fruits and a smooth finish, but its flavours were not enhanced by the pairing. See here and here for some better pairings for this wine. 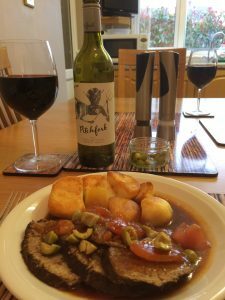 The next wine was a bottle of Castillo de Viñas Crianza, Rioja 2012, a medium-bodied Spanish red from the Wine Society made from 90% Tempranillo and 10% Graciano. We detected red fruits on the nose, with flavours of strawberries and a creamy vanilla finish. A marginally better match, but not great. 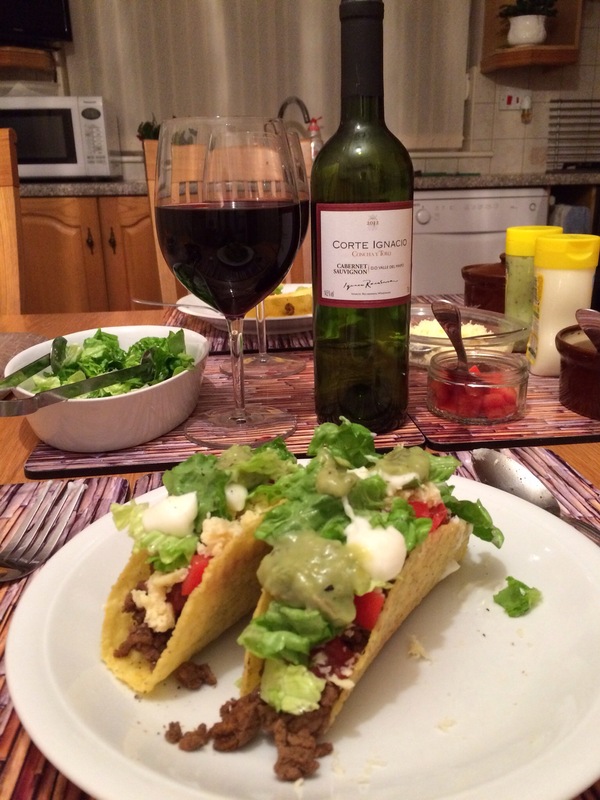 Which Chilean Red with Beef Tacos? For a midweek meal we had Old El Paso’s Taco kit. Taco shells are loaded with minced beef cooked with a spice mix containing seasoning, paprika and cumin. The tacos are topped with salsa, tomatoes, grated Cheddar, sour cream, guacamole and crisp lettuce. With so many flavours, finding a good wine pairing is a challenge. Research online suggested a variety of options including Tempranillo, Shiraz and South American reds. We decided on a bottle of Corte Ignacio Concha y Toro Cabernet Sauvignon 2012, a full-bodied Chilean red from the Wine Society. A couple of mouthfuls indicated this was not a good match, so we set the wine aside. We turned to a bottle of La Moneda Merlot Reserva 2014, another full-bodied Chilean red, this time from Asda. We detected red fruits on the nose, dark plum flavours and a spicy finish. 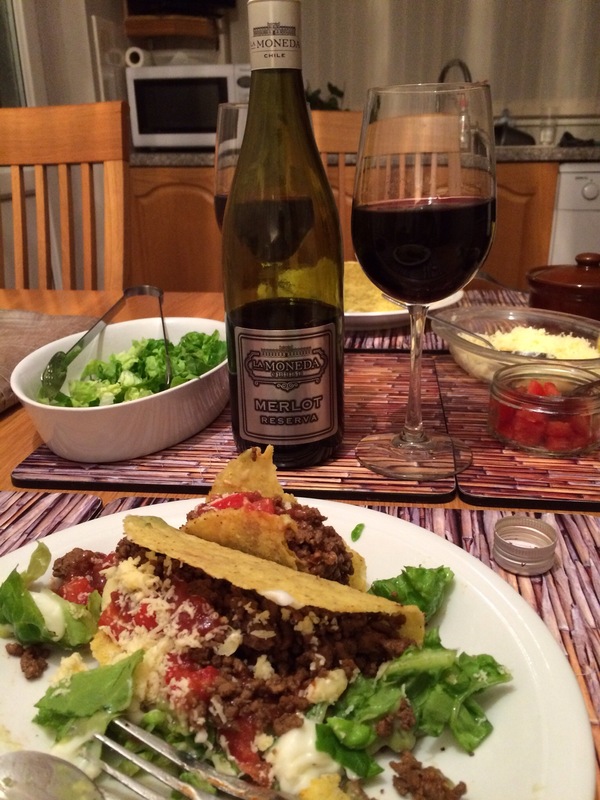 Whilst the wine was a good match with the tacos, we will try to improve on the pairing next time. 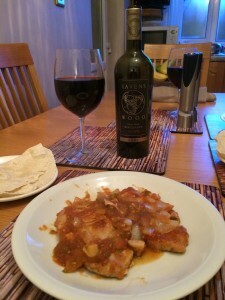 Posted on December 2, 2015 Categories Full & Rich, Red WineTags Asda, Beef, Cabernet Sauvignon, Chilean Red, Merlot, Mexican, Old El Paso, Tacos, The Wine SocietyLeave a comment on Which Chilean Red with Beef Tacos? We cooked a modified version of Jamie’s Roast Chicken with all the Trimmings. The chicken is rubbed all over with butter flavoured with lemon zest and thyme. A lemon and thyme sprigs are placed in the cavity and the chicken is then roasted with garlic, sliced potatoes, carrots, sweet potatoes and parsnips. However, we used turnips instead of parsnips. 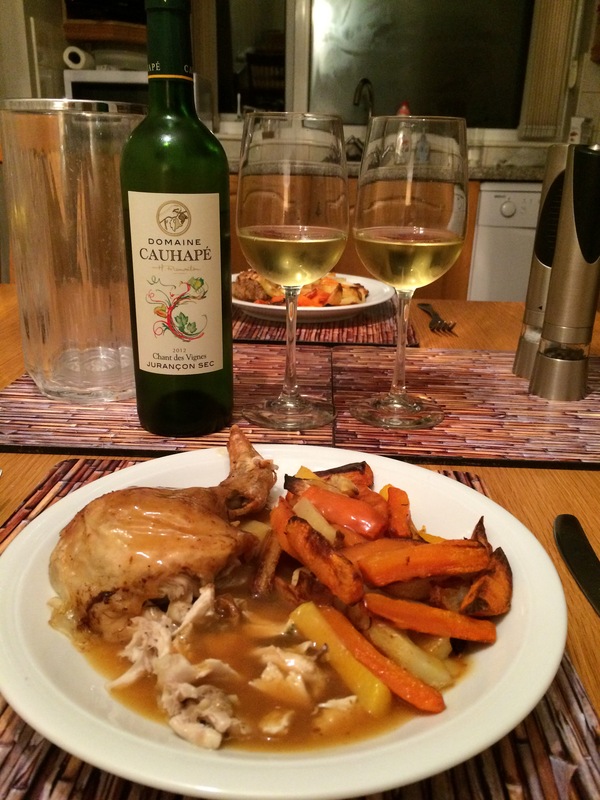 We have read that Jurançon Sec is a good match with roast chicken and so we opened a bottle of Domaine Cauhapé Chant de Vignes Jurançon Sec 2012, a Southern French white from the Wine Society. We detected a slight initial sweetness, smooth tropical fruits, followed by a pleasant tangy grapefruit finish. 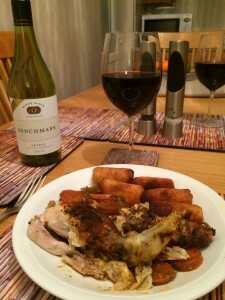 We though the wine was a very good match with the roast chicken. We tried Sri Lankan Chicken Curry from Rick Stein. Chicken pieces are fried with cinnamon, cardamon pods, cloves, shallots, garlic, ginger, chilli powder, turmeric and roasted Sri Lankan curry powder. The curry powder consists of rice, coriander seeds, cumin seeds, fennel seeds, a cinnamon stick, fenugreek seeds, cloves, cardamon seeds, black mustard seeds, black peppercorns and dried red kashmiri chillies, all ground into a fine powder. The chicken is then cooked with chopped tomatoes, curry leaves, pandan leaf (we used bay leaf with dried basil), lemongrass, and green chillies. Coconut milk is added near the end. We served with Thai rice and prawn crackers. Given the ingredients involved we were surprised that the overall flavour of the curry was a bit muted. Still pleasant enough though. 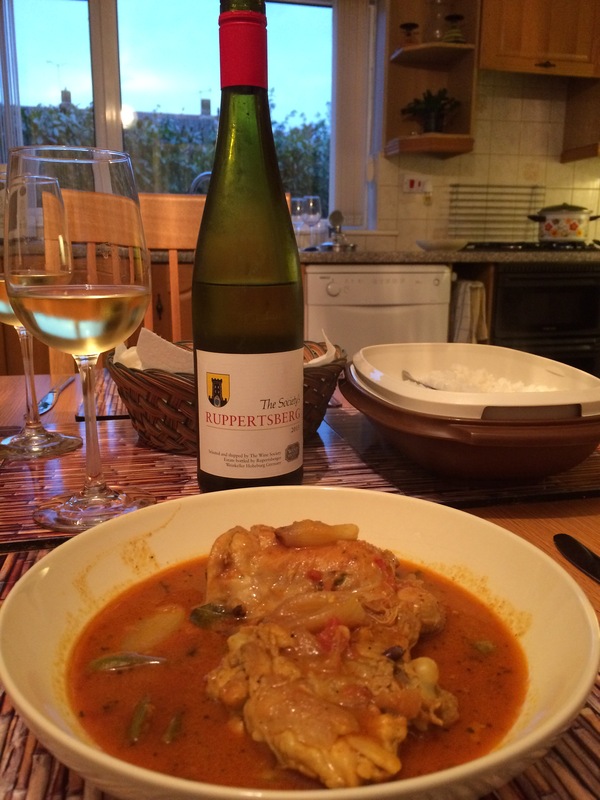 We opened a bottle of The Society’s Ruppertsberg 2013, a slightly off-dry German white from the Wine Society. We enjoyed its good acidity and citrussy lemon and lime flavours. A good match with the meal. 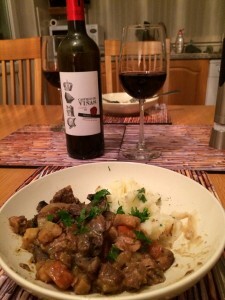 We’ve been watching Rick Stein’s “From Venice to Istanbul” cookery programme and thought we’d try his lamb kleftiko. 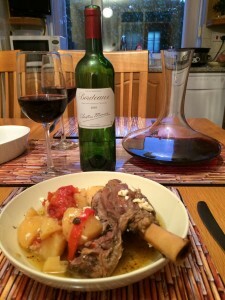 However, we modified the recipe by using lamb shanks instead of leg and we cooked it in the slow cooker. The lamb shanks were put in the slow cooker along with waxy potatoes, red pepper and tomatoes. We poured lemon juice and olive oil over the lamb and added garlic, oregano and water. We added Feta cheese towards the end. Very tasty. We decided on a bottle of Christian Moueix Bordeaux 2010, a Merlot-based French red from the Wine Society. We paired a previous bottle of this wine with lamb shanks and enjoyed it. There was an initial cherry sweetness followed by flavours of blackberries and dark plums, with smooth tannins. A very good match with the kleftiko. 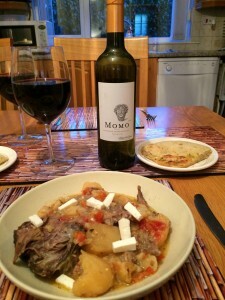 We enjoyed the leftovers a couple of days later and tried a bottle of Momo Ribero del Duero 2010, a full-bodied Spanish red also from the Wine Society. This Tempranillo was inky black in the glass with black fruits on the nose. We tasted vanilla sweetness and black fruits from this powerful and smooth wine. It was almost as good with the lamb as the Bordeaux. 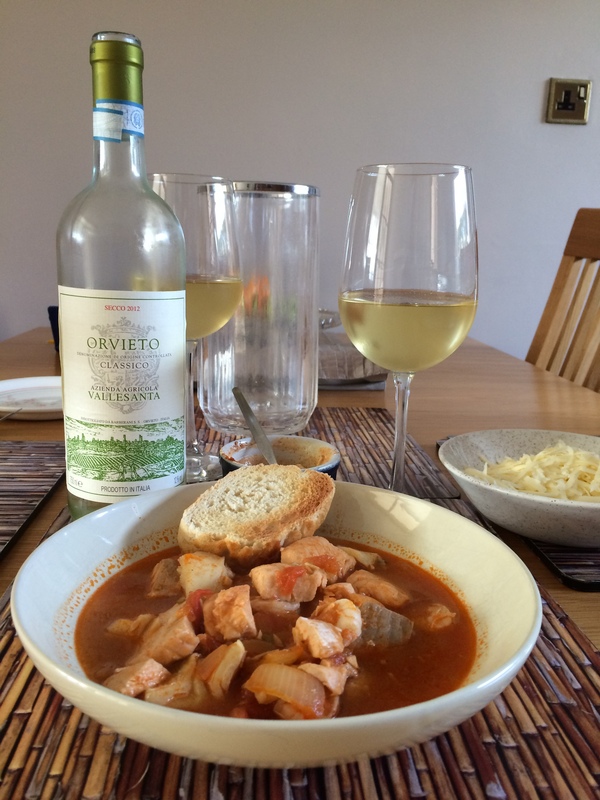 We tried the mixed fish stew with croutons recipe from ocado.com. We cut some salmon and smoked haddock into pieces, added some prawns and simmered in a stew made from garlic, tomato purée, onion, tomato, fennel seeds, saffron, paprika, fish stock, salt and pepper. We served the stew with croutons, grated Gruyère cheese, a parsley garnish and a rouille made from mayonnaise, cayenne pepper, saffron and garlic purée. Very tasty. We’ll do this recipe again. We opened a bottle of Orvieto Classico Secco, Barberani 2012, an Italian white from the Wine Society. We found the wine slightly off-dry, fresh with good acidity and lovely creamy citrussy flavours. A very good match with the fish stew.